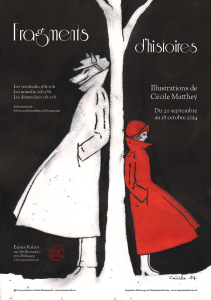 Cécile Matthey, exhibition « Fragments d’histoires » at the gallery Espace Kairos, Fribourg (Switzerland), 20 September–18 October 2014. Q: Your work is of course well-known to readers of TFF. Could you tell us a bit about how you put your exhibition together, what the themes and focus are? Q: Espace Kairos is an independent gallery featuring the work of local talent. Tell us more about this gallery: how does it work? Which other local artists will be featured in coming months? Cécile: Espace Kairos is a small gallery located in an old house close to the cathedral of Fribourg (Switzerland). It is run as a non-profit activity by Vincent, a man who wishes to promote local artists in a simple and convivial way. The exhibitions, usually lasting one month, are very varied: paintings, drawings, sculptures, puppets and so on, and can include cultural happenings such as concerts or readings. The gallery has been successful for a few years now. But Vincent has new plans for the future and unfortunately, Espace Kairos will close in December. After “Fragments d’histoires”, two more artists will show their works: André Stauffer, who makes drawings in “ligne claire” style, and the painter Pierrick Matthey (perhaps a distant cousin of mine?). Now show us some of the art! 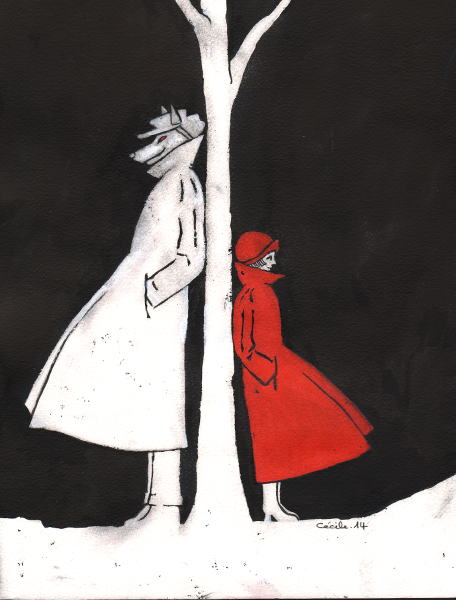 This interpretation of the well-known fairy tale is inspired by an old-fashioned advertisement, originally showing an elegant pair leaning on either side of a street lamp. The technique used, involving Indian ink and gouache, makes it look like an etching. It requires a little courage, because the drawing must be completely soaked in water, and the result is not entirely predictable. This piece was made as a poster advertising the theatre play by Shakespeare. It was all about showing the archetype of the villain in a simple but scary way. 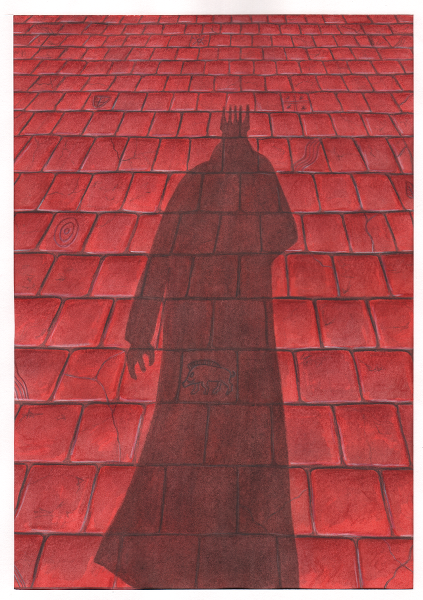 A shadow is a good way to achieve this, as I remembered from the old film “Nosferatu” by Murnau. To create the silhouette, I posed in the sun wearing a long thick winter coat, and added a menacing spiked crown inspired by John Howe’s version of Sauron and… the top of the cathedral of Fribourg! 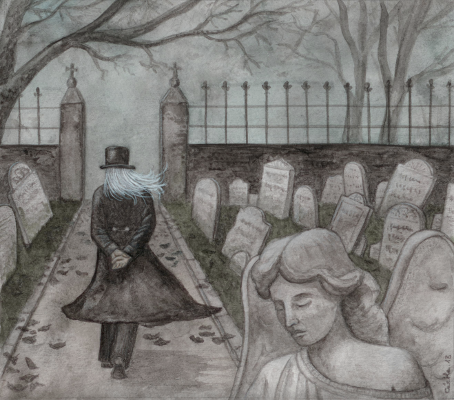 To give a sense of the melancholy and solitude of the protagonist, I drew him seen from the back, walking among the graves at dusk. The long white hair brings some strangeness and ambiguity to the character, and adds contrast. The cemetery is inspired by old English and American cemeteries, which always impress me with their gravestones all askew—you wouldn’t see that in Switzerland. 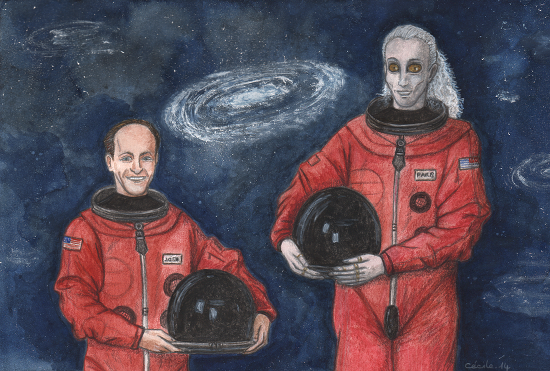 This illustration is inspired by the souvenir photos made by the NASA before each mission, showing the astronauts posing in their suits, smiling. It seemed a simple and elegant way to evoke the first flight out of the solar system, on which the story is based, and the main protagonists. Josh is inspired by Claude Nicollier, a Swiss astronaut. As for Paris, I found it hard to draw an attractive alien with huge eyes, avoiding the Roswell cliché. In the end I used a tarsier's face as a reference, because it is strange but cute! Send your submissions to accessingfutureatgmailcom by midnight UTC on November 30th, 2014. Length 2500-7500 words (with a preference for 4000-6000 words). Attach your story as a .doc, .docx, or .rtf file, with your name, the story title, and the wordcount on the first page. We do not require or request that submitting writers identify themselves as a person with a disability, but we respect anyone’s desire to self-identify. We want stories that place emphasis on intersectional narratives (rejection of, undoing, and speaking against ableist, heteronormative, racist, cissexist, and classist constructions) and that are informed by an understanding of disability issues and politics at individual and institutional levels. We want to read stories from writers that think critically about how prosthetic technologies, new virtual and physical environments, and genetic modifications will impact human bodies, our communities, and planet. For details, see the full CFS at futurefire.net/guidelines/accessingfuture.html. 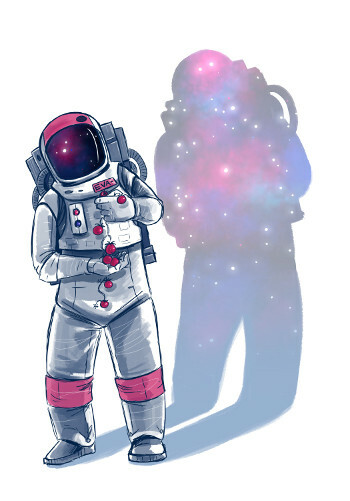 We're on the last day of the Accessing the Future fundraiser (igg.me/at/accessingfuture) with only nine hours to go and fast approaching our second stretch goal (which at $8000 will give us internal, black and white illustrations). I won't be awake when the final clock ticks over, so I'm leaving you with this final list of all the guest blog posts, interviews, plugs, and other words about the campaign and the anthology that have been posted in the last six weeks. Many thanks and much love to all of the people who have donated perks, blogged for us, spread the word in other ways, and contributed to the fundraiser itself. You (yes you!) have made it so this anthology will be excellent. That's it so far! Next up, the Call For Stories will open tomorrow. (Watch this space!) In the meantime, there are still a few hours to pre-order the anthology or claim the last few perks. Please stop by igg.me/at/accessingfuture and help any way you can! Newsflash: Accessing the Future will be a full-length, pro-rate paying anthology of disability-themed science fiction! Thanks to all of our lovely supporters, the fundraiser reached $7000 this morning. After paying fees and honoring all the rewards for the fundraiser, we will now have enough funds to produce an anthology of a little over 65,000 words of fiction, paid at 6¢/word, to pay our cover artist Robin E. Kaplan a fair artist fee, and to print off a few dozen review copies of the finished anthology next year. At $8000 we will commission internal, black and white illustrations for the anthology. Even if we don't quite make these goals, every penny we receive in this fundraising phase will go into making the anthology bigger and better. The call for stories for Accessing the Future will open on Wednesday, September 17th, just after the end of the fundraiser. 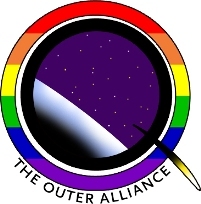 The campaign to fund Accessing the Future, a disability-themed science fiction anthology, reached its first funding goal yesterday! At $4000 the anthology is guaranteed to happen, and will pay at least $0.03/word (“semi-pro” rates) to authors. But we have two weeks left on the fundraiser, and support is still going strong, and we have a stretch goal of $7000 in sight. If we reach this goal, Accessing the Future will be a full-size anthology and all authors will be paid SFWA-defined “professional” rate of $0.06 per word! (1) We’re delighted to announce that Robin E. Kaplan will be producing the cover art for the Accessing the Future print anthology! 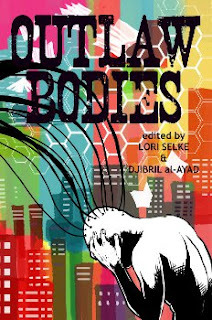 For those of you who don’t know Robin’s gorgeous work, she illustrated the cover of Outlaw Bodies, and front covers of several issues of The Future Fire magazine. Her website The Gorgonist (and her Etsy store) features more of her art, and we featured an interview at TFF News a few years ago. I think you’ll agree she’ll do a great job with the artwork. 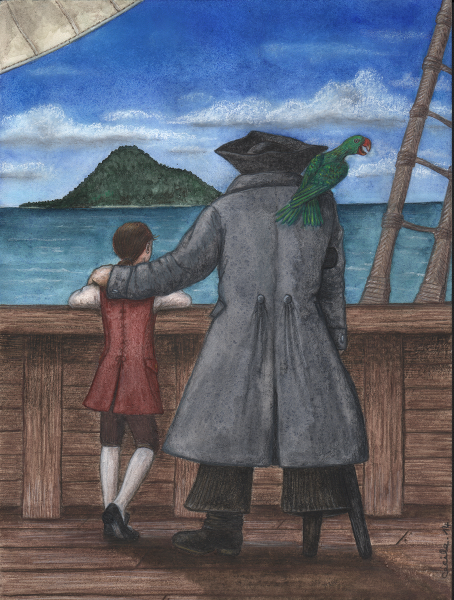 You will receive a signed mini poster print of the cover artwork by illustrator Robin E. Kaplan, on archival photo paper. You will also receive the Accessing the Future anthology in trade paperback and DRM-free e-book. 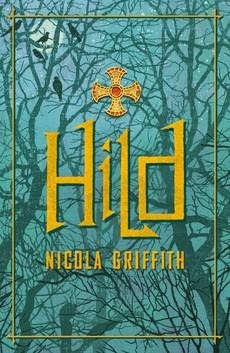 Nicola Griffith (winner of Nebula, Tiptree, World Fantasy and Lambda awards, and author of Ammonite and Hild) will name a character after you or a person of your choice in a forthcoming fantasy novella. (Note this may take some time to appear.) You will also receive the Accessing the Future anthology in trade paperback and DRM-free e-book.